If you are a fan of the Philadelphia Eagles, you know how amazing this past Super Bowl was for us. Similar to the dream of never having a truck break down in July, it was something fans never thought they would see. As a fan, watching the Eagles play in the Super Bowl (I never get tired of saying that) was huge. But watching them win was like an endless supply of free cheesesteaks — a dream come true. When the Eagles won the NFC Championship on Jan. 21, it was an amazing feeling. But the feeling was even better when I went to work the next day and I received the call about the potential Super Bowl parade. A Royal Flush has been serving the mid-Atlantic area since 2005. We have been lucky enough to be the restroom provider to the city of Philadelphia since 2009. With that contract come certain events each year. That contract was part of the reason we were chosen to provide the toilets when the pope came to visit in 2015. A Royal Flush has been in business since 1992. We service from Massachusetts down to Delaware and have been party to some historic events in the past. We have been lucky enough to be a partner to 21 New York City Marathons, the Super Bowl in 2014, the papal visit in 2015, the Democratic Convention in 2016 and many more. 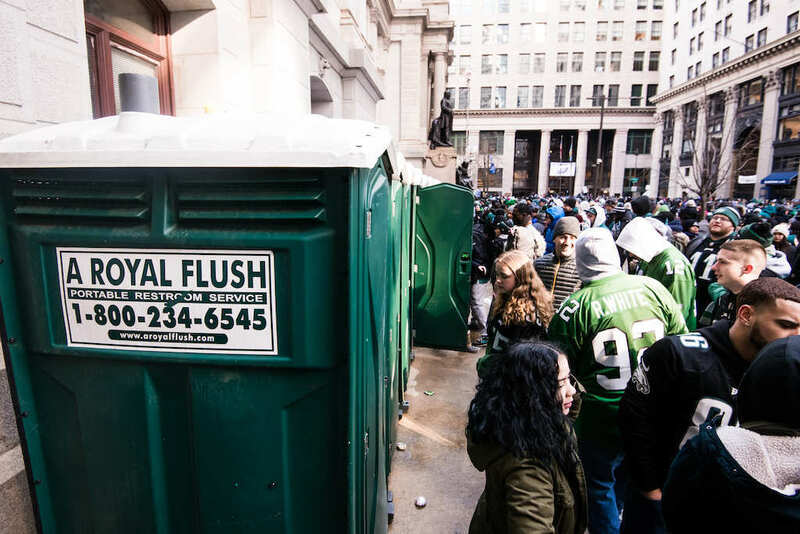 When the City of Philadelphia Special Events department reached out to me, the first question was, “How many toilets do you own?” Given how many years this city had gone without a championship, the event director knew this parade would be bigger than the 2017 NFL draft and bigger than the 2015 papal visit. I was never worried that I wouldn’t have enough equipment. We own around 10,000 toilets, and I am lucky to be based in an area with top-notch competitors who I can depend on when we need extra equipment. The quantity of equipment was never the true problem. Time was the biggest challenge we were facing. While we had a month to deliver over 3,500 toilets for a crowd of around 800,000 people at the 2015 papal visit, we would only have 36 hours to deliver toilets for crowds that were expected to reach 700,000. On top of that, we had no way of knowing if the event would even take place until the Super Bowl ended around 10:30 p.m. on Sunday night. To prepare for an event that might not even happen is a hard pill to swallow. But in this industry, you know that events are fickle customers. Hurricane Sandy canceled the New York City Marathon in 2012 after we had already delivered over 1,500 toilets. Other events have been canceled at a moment's notice, and there is nothing you can do but try to get some compensation for the time put in. In this situation, we could put in as much effort as needed, but if the Eagles lost, it would be time and money wasted. The city of Philadelphia is a great event partner, and they had a final order to us by Wednesday morning, before the big game. That gave us time to take care of paperwork, clean toilets and plan for the deployment of drivers and trucks from other branches to help our Philadelphia team. Without the help of my operations team of Tony Mack and Mauro DaSilva, I would not have been able to sleep that Sunday night. Our team led a group of drivers that left our Connecticut and New York branches around 2 a.m. on Monday morning and started delivering the moment they hit Broad Street, which runs from Lincoln Financial Field, home of the Philadelphia Eagles, to City Hall. From there, the parade route would turn and head toward the Philadelphia Museum of Art, home to the famous “Rocky Steps.” In hopes of a Philadelphia win, we already had the 700 toilets clean, supplied and ready to be delivered. Monday was a long day, considering we were working around increased traffic, as people poured into the city, and our employees worked really hard to safely maneuver around the growing crowd. But we had a stroke of luck when a snowstorm snuck up in the forecast for Wednesday, which delayed the parade from Tuesday to Thursday. This gave us more time to deliver over 700 toilets to the parade route. No one will deny that Philadelphia is a tough city. According to Wikipedia, our fans were selected the most intimidating in the NFL. So we went into this event knowing there would be damage. That’s a given with a celebratory crowd, reported to have been drinking the free beer, given out by sponsor Bud Light, since 4 a.m. that morning. What we didn’t expect was some of the backlash from the media. No one can deny that there weren’t enough toilets. If you compare this event to the papal visit, there weren’t nearly enough. But given a 36-hour window for delivery and only being allowed to deliver what your customer orders really hampers what you can do. Honestly I have never been to an event where people actually said there were too many toilets. This is a common complaint, but when multiple news channels mention it, it can be a tough pill to swallow. At the end of the day, we can take the damaged units and the bad press because we know that we were part of such a historic day. As the daughter and granddaughter of lifelong Eagles fans, I am thrilled that my company was part of this. 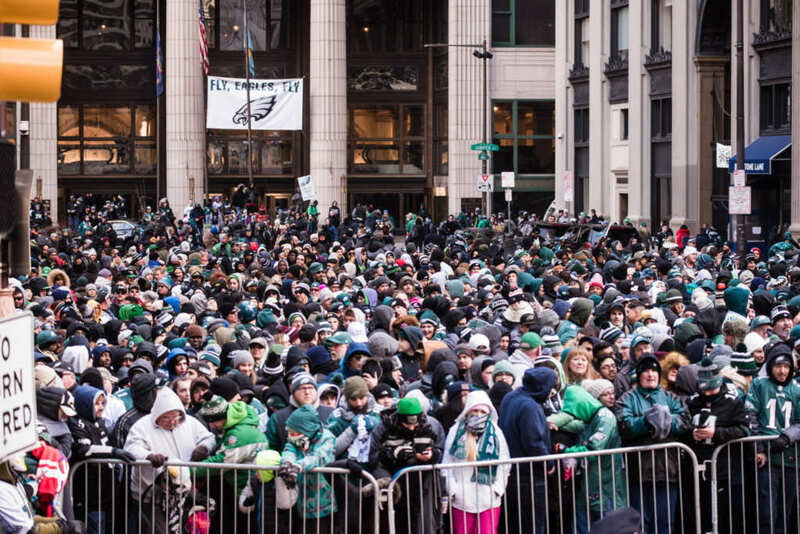 According to the city, this was the largest crowd ever assembled for an event in Philadelphia. Hopefully there will be many more epic events for us to be a part of.